AMD's David Wang says all the right things in his first public appearance. PC enthusiasts who are fed up waiting for new GeForce cards from Nvidia may be more excited by AMD. David Wang, AMD’s new graphics chief, said he’s committed to delivering a new product every year, like clockwork. Interestingly, Wang, the senior vice president of engineering for AMD’s Radeon Technologies Group, seemed to blame the AI-oriented Radeon Instinct as at least somewhat of a distraction. That’s somewhat ironic, given that the 7nm Vega GPU that AMD showed off Wednesday local time at Computex will be used for the Instinct series. 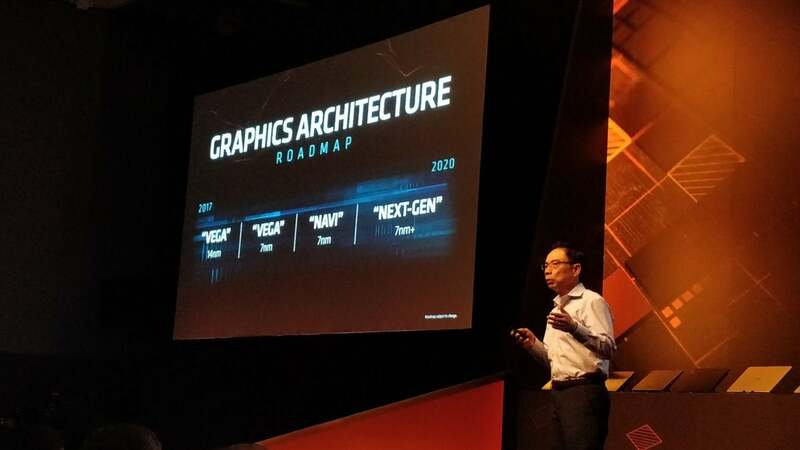 During his time on stage at Computex, Wang showed off AMD’s (unchanged) graphics roadmap, stretching out a full three years from 2017’s Vega chip through an undisclosed 7nm+ architecture debuting in 2020. In fact, Wang’s roadmap should look familiar to anyone who’s followed Intel over the years, as AMD’s graphics roadmap essentially follows a traditional “tick-tock” model: a new architecture followed by a process adjustment or shrink, and vice versa. All that said, Wang’s graphics presentation was overshadowed a bit by a new, massive 32-core 2nd-generation Threadripper—AMD’s bid to battle Intel in the enthusiast CPU arms race. Wang went on to say that he felt that “AMD had lost momentum” in terms of gaining mindshare in the consumer enthusiast space. “I think, you know, that we lost momentum in all of the media, spending all our energy in chasing AI.” Wang appeared to be referring to the Radeon Instinct, which is used for deep learning and artificial-intelligence applications. “What I’m trying to say is that we want to go back to that cadence to make this business more fun,” Wang said. Wang, who previously oversaw system-on-a-chip (SOC) development for AMD before leaving for Synaptics, rejoined AMD in January after Raja Koduri, his predecessor, left to join Intel as the head of a newly formed discrete graphics business. Though Wang and AMD didn’t actually launch a new GPU product at Computex this year, the company did say that PowerColor’s Radeon Vega 56 Nano, a tiny card designed for mini-ITX systems, is now available. And the 7nm Vega GPU, originally designed for deep-learning applications, will eventually arrive as a consumer GPU as well, AMD chief executive Lisa Su promised. Will that GPU arrive before Nvidia delivers? We don’t know. But AMD is at least pledging that gamers will have something to look forward to every year.